Lean Thinking: United Airlines & Air Canada – Lowest of the Low? 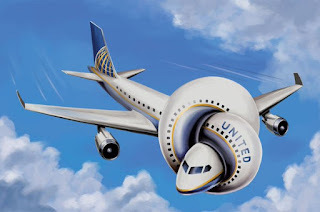 United Airlines & Air Canada – Lowest of the Low? Recently I broke a personal rule and booked a United Airlines trip. Smarting from UA fiascos, I did so with trepidation, after a three-year hiatus. Anyhow, my family and I were going to beautiful Bend, Oregon, where we’d hike, swim, and celebrate a family birthday. The result? A 12 hour delay going; 4 hour delay returning. United offered no explanation, of course, no apology, and no sense of responsibility. Fine weather both ways, so no problem there. We were scuppered by mysterious ‘mechanical’ problems, which no doubt UA deep thinkers had never encountered before. When I described our travails to Bend friends, they were unanimous. Needless to say, it’ll be years before I allow wild horses to drag me onto an UA plane. But wait! Recently, Air Canada did one worse, stranding passengers in Manchester, England for two days. For episodes like these, satire is redundant, no? All one can do is avoid the perpetrators like a proverbial plague (after going up to the roof and howling…). Don’t want to be misunderstood. The UA front line people we encountered were decent, sympathetic and did their best to help. As ever, the problem lies in the system. UA (& Air Canada) leadership has apparently made a conscious decision to ignore customer service. Thought you’d like to know so you can avoid United Airlines and Air Canada. Let us direct a chorus of howls, catcalls and raspberries their way. And a deep bow to carriers who are committed to customer care.